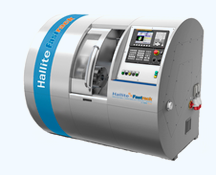 The Hallite 533G bearing is a version of the Hallite 533, which has axial grooves to allow fluid bypass. This bearing is most often used in hydraulic ram application where such a feature is required. Like the standard 533 bearing the 533G is compatible with hydraulic and lubricating oil. It is not suitable for use in applications where water based fluids are used, nor is it suitable in applications where significant water is present, because of the swell of the nylon. Note: Metric sizes are also available upon request. For further information about these and any other sizes that you are looking for, please contact your local Hallite sales office.